Odyssey White Hot RX Rossie and 2-Ball putters. The new White Hot RX putters ($160, standard; $180 with SuperStroke) feature a new iteration of the highly successful White Hot insert that features a dual layer construction with a softer core for improved feel and feedback. The new insert provides a smoother roll due to an oval pattern design (also used in Odyssey’s Works models) as well as a textured clear coat finish that increases friction at impact. The new RX line includes #1, #2, #7, #9, Rossie, 2-Ball and V-Line Fang models. Each model is available with a standard rubber or SuperStroke grip. The new White Hot RX putters will be available at retail on February 26th. 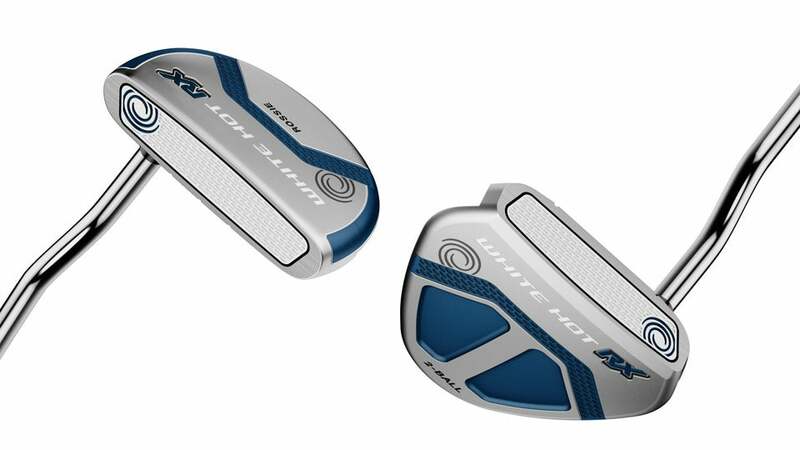 Odyssey has also extended their Works line of putters with three new models including the Versa #7H ($179.99 standard, $199.99 with SuperStroke), Versa Sabertooth ($199.99 standard, $219.99 with SuperStroke), and Versa Marxman Fang ($199.99 standard, $219.99 with SuperStroke). All three models feature a Fusion RX insert that combines the famed White Hot design with an ultra thin stainless steel mesh and Metal-X roll pattern. The result is enhanced feel with reduces skidding and a purer roll. The new Works putters will be available at retail on February 5th.